Is the Z3X a real thing? We first heard of the Sony Xperia Z3X back in July, and while not much has been heard in the interim months a new benchmark has now appeared pointing to a truly bleeding edge handset. The benchmark appeared on AnTuTu and listed a phone believed to be the Xperia Z3X as having an octa-core 64-bit Snapdragon 810 processor, 4GB of RAM, an Adreno 430 GPU and a 6.2-inch 1600 x 2560 display. All of that roughly tallies with what we'd heard before, with the original rumours from July pointing to a 1152 x 2560 Trimaster EL OLED display and a chassis measuring 69.5 x 150.1 x 7.9mm. Indeed those rumours were accompanied by an image of the chassis which looked somewhat less than convincing thanks to awkward dimensions and an oversized camera lens. Given that this latest benchmark lines up though it's possible that this is a real thing after all, though bear in mind that benchmark results can be faked. That oversized camera, if you're wondering, is supposedly a curved Exmor RS, with a 22MP sensor, so it should be pretty good. 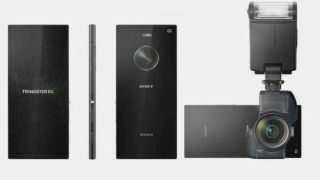 If the Z3X is a thing that exists then the next question is where it fits into Sony's product line. Is it designed as a successor to the Xperia Z3 or to the Xperia Z Ultra? Or as something else altogether? We'll have to wait and see, but with specs like this we can tell you now that it probably won't come cheap. After something smaller? Check out the Xperia Z3 Compact.